New York or New Jersey, professional musicians, dancers, theater artists, filmmakers, creative writers and visual artists from cities throughout North America convened for performances, workshops, lectures and a Shabbaton in order to integrate arts expression with Torah values. Created in 2008 by Miriam Leah Gamliel, who studied and performed musical theater before becoming observant, she began producing work in women-only settings, eventually working towards ATARA. It grew exponentially with programs serving a community of Torah observant artists, who flocked to the group to promote their work and share inspiration. Their networks continue through yearly conferences, monthly newsletters, an active Facebook group and website that promotes and facilitates performing arts and educational opportunities for hundreds of women, mostly in the US and Israel. “ATARA is serving people from across the Jewish world in multiple cities with multiple abilities,” says Gamliel. She explains that their events are much more than just open mics – the professional three hour performance Saturday night drew hundreds at Bnos Yisroel of Baltimore that showcased over 25 observant female songwriters, vocalists, musicians and dancers for an uplifting evening of original music and choreography. Artist boutiques sold art prints, books, and women-only music and DVDs in the lobby. The weekend launched Thursday with an intimate, elegant evening of classical music modeled on the 19 century salon of the late Jewish salonnière Sara Levy. Instrumental and opera performances featured both local and guest musicians who played piano, flute, cello and violin. Over Shabbat, community leaders spoke about the role of music and arts in Jewish life. Rebbetzin Dahlia Topolosky of Congregation Beth Joshua in Rockville, MD, led a women’s musical Kabbalat Shabbat with Carlebach melodies and at the closing Shabbat ceremony led a musical havdalah kumsitz with her guitar. By the artist’s dinner Friday night, Rebbetzin Topolosky spoke about the “The Power of Niggun” in her journey of finding meaning in Judaism, and after Shabbat lunch gave an in-depth shiur on the sources of music in the Torah. Another “rebbetzin with a guitar,” Chavi Epstein, co-director of Chabad of South Carolina and founder of the “niggun workshop seminar,” spoke on “Serving Hashem with Pleasure and Delight.” Sunday morning she gave a workshop on the power of niggun to heal and open the soul while she sang and taught the tunes accompanied on her guitar. Following Shabbat dinner were performances by the “kosher mime,” Stella Filler from San Francisco, followed by interactive improv theater activities, including Playback Theater led by Amy Guterson, director of Pittsburgh’s Tzohar Seminary for Chassidus in the Arts, whose students performed throughout the weekend. The keynote presenter by Shabbat Dinner, Robin Garbose, Artistic Director and founder of Kol Neshama Performing Arts Conservatory for girls and a film, theater and TV director, shared her groundbreaking journey creating three feature films (“A Light for Greytowers,” “The Heart That Sings” and “Operation Candlelight”), intended for audiences of women and girls. While there was initial controversy over the concept, the films were ultimately screened and drew packed audiences. Garbose stressed the need for women’s art in the larger world and gave workshops on screenwriting and directing. Garbose’s latest adventure film, “Operation Candlelight” was screened Sunday night at the ATARA conference along with the first episode of Leah Gottfried’s hit web series “Soon By You,” about modern orthodox dating. Gottfried trained by Garbose’s performing arts camp and produced “Operation Candlelight”; the two joined a panel discussion on frum filmmaking. Composer, singer and performer, Franciska Kay (a.k.a. 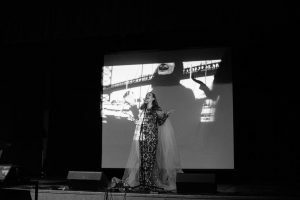 Freydie Kosman) performed at the concert Motzei Shabbat, which was emceed by Leslie Ginsparg of Girls Night On Baltimore and comedienne Elana Greenspan. Kay creates her masterpieces by weaving eternal words of prayer into soulful guitar melodies, accompanied by visually appealing music videos on stage. Raised in religious school and in musical academy, Kay’s compositions reflect her commitment to bridging both worlds. Sunday morning’s Yom Iyun for the arts included an impressive array of workshops and master classes in acting, voice, dance and writing by professional, observant arts educators. It was followed by a matinee performance in Bnos Yisroel’s magnificent synagogue sanctuary, featuring opera, classical voice, music ensembles and women’s orchestra. The concert included Gamliel singing musical theater, The Baltimore Women’s Orchestra with clarinet soloist Rivki Silver and Baltimore’s premiere women’s band Ayelet HaShachar, featuring three Orthodox women on piano, guitar and vocals. Interested in finding a summer program for young Orthodox women interested in the arts? Check out Camp Maor, an amazing opportunity through NCSY.